Today we are going to talk about some of the hot topics in the market right now. I’m sure some of you have heard about Blockchain and Cryptocurrency; are they the same? No they are not! Continue to read if you would like to know the differences of Blockchain vs Cryptocurrency and The Future of Blockchain Industry ~ LEDGIT SEDA and BITBUBS. Our curiosity about the evolution and growth digital assets and wealth has brought us to ‘The Future of Blockchain Industry Forum’ that was held at Kuala Lumpur Convention Centre recently. It was organized by LEDGIT, a Malaysian owned company in digital ledger in economic transactions industry. 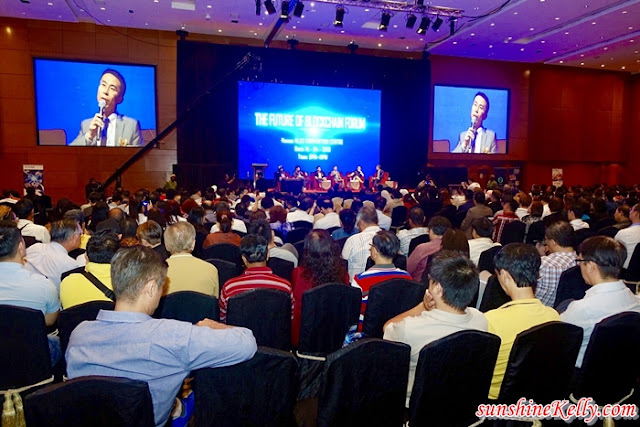 The forum focuses on educating the public about blockchain and cryptocurrency technology; blockchain platform for supply chain and traditional cultures provenance; and what are expected in the future and in turn, fully utilize the technology for various purposes. Officiated by the CEO of Ledgit, Mr Ivan Ku, the event was attended by more than 1000 participants. The panel of international speakers include Mr Fengsen, the Founder of Blockhong and Deputy Secretary General of World Blockchain Institute (China), Mr. Mark Pui, Blockchain Investment Guru (Malaysia), Mr Lurion Yee, Founder of SEDA (Malaysia), Mr. Yao Han Lim, CEO of Blockchain Games Company (Malaysia), Ms Jia Nina, Marketing Director of Blockchain Games Company (Malaysia) and Ms Saba Harati, Researcher of Blockchain Games Company (Iran). The existence of blockchain technologies such as IE and Bitcoin have created a platform for the global public to grow digital assets and wealth. The emergence of the new technology has also benefited global financial market by adapting new ways to invest, facilitate peer to peer electronic cash transactions and more importantly for the betterment of financial ecosystem. Blockchain is a technology and cryptocurrency is an asset. The initial objective of the creation of the blockchain is to create a technology to facilitate a trustless transaction ecosystem. And cryptocurrency is the asset that is being used as settlement for transaction. IE, Bitcoin blockchain would be the technology that uses Bitcoin, a native cryptocurrency to facilitate peer to peer electronic cash transaction. This forum highlights the alternative usage of blockchain technology through supply chain and traditional cultures provenance, recruitment industry and well as gaming industry. What it LEDGIT’s vision in the supply chain industry? We envision a future whereby the flow of information which may impact the decisions we make in our daily routine can be very easily and readily available with just several simple actions on our smartphones. A very easy and user-friendly smart apps to access to the roots and origins of products to ensure the quality, authenticity and ownership of the products while also maintaining the trust between businesses to businesses (B2B), businesses to consumers (B2C) and consumers to consumers (C2C). What kind of partnerships/entities are LEDGIT planning to engage? We are definitely going for all the categories in the supply chain, such as the governments, suppliers, manufacturers, retailers, distributors, wholesalers and the end-users throughout the globe. This is to ensure that all parties can be involved in this transparent flow of information and provenance ecosystem. As for the directions, we will be coordinating with relevant parties from Malaysia, China, Indonesia, Vietnam for the initial stage. How is LEDGIT planning to expand its market? After the completion of the apps which is estimated to be within the period of July to August, we will start with the market niches in Asia. However, the necessary steps and procedures for expansions had already started on March of 2018. When can the LEDGIT apps be downloaded? It is estimated to be available in Android OS and iOS around August of 2018. One of the focus of LEDGIT is in the cultural heritage, can you elaborate more on that? Yes. Other than providing solution features in the supply chain which may ultimately change the entire flow in consumption, we are also focusing on providing several features on the family and cultural lineage in our smart application platform as well. These features enable people to be able to track their origins of their pedigrees and ancestries while also being able to maintain these intangible values and pass on to future generations. We acknowledge the importance of cultural legacy. Cultural legacy can have either a positive or negative effect on success. Passing on beliefs, ideas and methods of doing things all relate to cultural legacy. What do you think of this forum that you hosted? Well, I think that in overall the forum was successful especially during the sharing session and the panel discussion session by the prominent speakers. The way they expressed their experiences and insights on the blockchain technology to the public. This way the public can gain more exposure on how the blockchain technology can transform the traditional industries and also increase the living standards. We definitely support the widespread of the education on financial tech (Fintech) to the public. What do you think of the current recruitment scene? The current recruitment scene has no streamline verification and validation service which is a crucial component in ensuring low volatility in human capital. Therefore, issue of distrust which is large downside caused bad hiring resulting in high turnover rate that will consequently incur losses to the existing operation. Therefore, a governance protocol should be retorted to ensure a provenance structure is established to ensure efficiency and effectiveness in the human capital department. How does blockchain serves as a solution provider in the recruitment sector? Blockchain allow recruitment to be done in a more streamline and cost efficient manner where it allow validation and scalability to happen at the same time. Decentralized database management allow for flood of data of applicant to be stored and retrieved at any time. Validation protocol will reduce the need for ground up verification every time a candidate’a credential need to be verified. The creation of peer to peer marketplace will allow mass access and rank of candidates, connecting businesses and workers, allowing a direct onboarding process without expensive engagement of intermediaries. What does SEDA hope to become and achieve in the human capital scene? SEDA hopes to become a streamline validation as a service provider which focus on creating a verified data collection module as a foundation for our future decentralized recruitment marketplace. Our objective is to create a more linear and transparent onboarding which is competitively more cost effective with a high scalability. In short, we aim to create a cheaper alternative of the current job boards and recruitment intermediaries while maintaining validated database module. What type of institutional partnership SEDA hopes to engage in near future? SEDA hope to engage in future partnership with educational institutions and businesses enterprise in order to achieve the verified data collection module. These institutions will be the foundation of SEDA veracity protocol as they will become the mass data pool and validation vendor for SEDA ecosystem. What would be SEDA future undertaking? The first down the roadmap would be SEDA decentralized recruitment marketplace which will connect job seeker and employer. When the data collection module has a foundation of user base, we will create an evaluation before onboarding module to create a more efficient onboarding process for both candidate and employer. We plan to expanse to other recruitment aspect as well as other provenance services that is related to human capital. At “The Future of Blockchain Forum” which was held at the Kuala Lumpur Convention Centre organized by a Malaysian owned company ‘LEDGIT’, Bitbubs Interactive Sdn Bhd revealed that it was building a new platform to venture into the future of gaming, one where blockchain technology transforms the game industry by increasing not just security but more importantly, playability. “For those of us who understand game skins, we can fathom the size of this USD 50Billion industry. Many already see the monetary potential and want a piece of that pie.” said Lim Yao Han, co-founder of Bitbubs, a new Malaysian based games company. Their platform, Blueprints, which is being developed to ‘redefine game skins’ will offer users true ownership of certain game assets, centered around the concept of intelligence. Set for release in Q4 2018, other features of blueprints would be portability across multiple gameverses and reward distribution for players, developers and creative contributors such as skinners and modders. Bitbubs is also developing its own mobile game called Beeznix. I am often to running a blog and i actually recognize your content. The articleabout Blockchain & Cryptocurrency Technology has really peaks my interest. I’m going to bookmark your site and preserve checking for brand spanking new information. Hi, Thank you for sharing out the news of event and also Ledgit. I hope that we can keep in touch as we can corporate out since there will be a lot of posting which can let you post in very soon. Thank you. How To Make Mason Jar Lights?